Smart, flexible, end-to-end sales analytics and forecasting. Find out how you will perform, and watch the forecast change with every call, email and meeting. Spot gaps in your pipeline to ensure you don't leave any money on the table at the end of the quarter. Keep your team on track with reverse-engineered KPIs to ensure they hit target this month, and every month. Identify game-changing insights, fast. Historic analysis uncovers key insights needed to drive future growth. Proprietary analytics available at your fingertips on web or mobile. 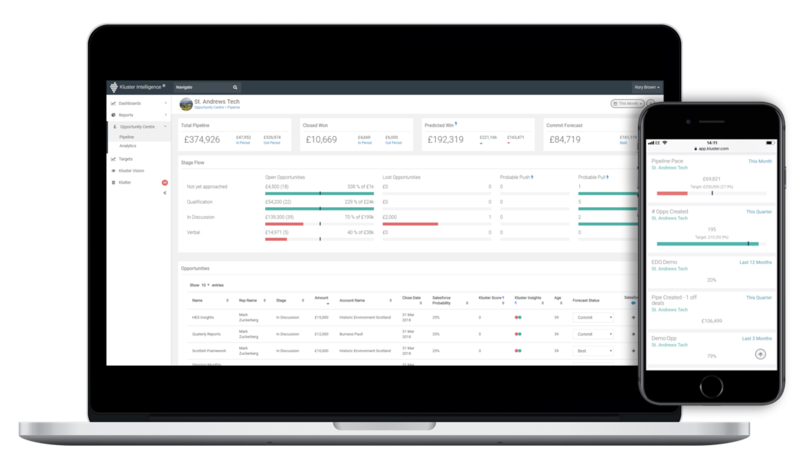 Alternatively, Kluster can integrate directly into your CRM for a seamless user experience. Find out why Kluster is the most advanced sales analytics platform available. "Kluster is critical to my day-to-day role"
"We just couldn't live without [Kluster] now."